The Storm Set is the two-book collection first published by NavPress and now reissued by N.I.P.I. and Storm Warriors International Press. 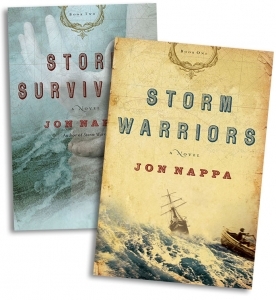 Both Storm Warriors and Storm Survivors offer gripping lifeboat-rescuing adventure in the historical age of 1800s storm and sail off of the coast of England when most of the available resource and technology consisted of nothing less than raw courage, naked grit and self-sacrificing heroics – with a dash of romance for good measure. In 2007, NavPress published Nappa’s original historical fiction novel, Storm Warriors. It went well and resulted in the founding of an International not-for-profit organization (Storm Warriors International) devoted to inspiring people to get involved rescuing others. The book is based on true-life rescues in the 1800s and the invention of the first unsinkable lifeboat in England. It remains an exciting read enjoyed by many avid readers but also by an increasing number of people inspired by humanitarian works and themes. Indeed, the book prompts a larger question: What does it take for anyone to risk his or her life for others? NavPress requested a sequel although Nappa had not initially intended one. After further research, he ultimately wrote a story about Sir William Hillary and his continuation of the lifesaving tradition from the Isle of Man in the years following the original story. Today, Storm Survivors stands on its own as a moving historical novel that inspires readers to reconsider how genuine success might be defined. Many end up adding both books to their library so N.I.P.I. has packaged the two-book set as shown here.